Abstract: The Krosno lithofacies is the Upper Oligocene–Lower Miocene synorogenic sequence that terminates the flysch sedimentation in the orogenic system of the Western Carpathians. Its deposition replaced the hypoxic sedimentation of the underlying Oligocene Menilite Formation. 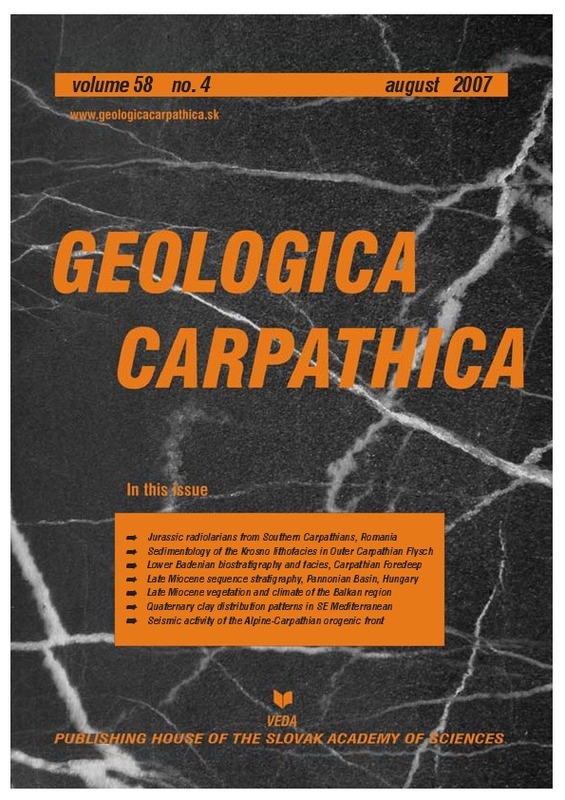 This change in deposition was connected with the Helvetian Neoalpine orogeny which iniciated the fundamental rearangement in the orogenic belt, gradual isolation of foreland basins and creation of the “Protoparatethys”. The differences in deformation between the Krosno lithofacies and the underlying Upper Cretaceous to Eocene strata are recorded in all tectonofacial units of the Outer (Menilite-Krosno) Group of thrust sheets. Moreover, a trend towards increase of ductile deformation from the outer to the inner margin of the Flysch Belt is evident. The investigation of translucent heavy minerals produced evidence of different spectra between the Krosno lithofacies and underlying strata of individual tectonofacial units. The spatial distribution of the Krosno lithofacies and the transport of clastic material from the SE indicate the deposition of a submarine fan that prograded to the NW.